Complete Rehab or Move In Ready - We Want to Buy It! 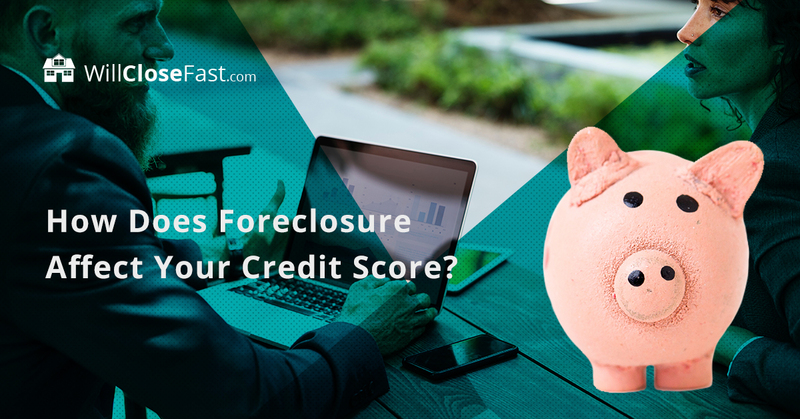 One of the first questions people have when they receive a foreclosure notice is, “How much will a foreclosure drop my credit score?” (Though, personally, one of the first questions we think people should ask is, “How can I avoid foreclosure?” Because, after all, it is possible.) Will Close Fast specializes in buying homes for cash to help homeowners avoid foreclosure. If you are at risk of foreclosing, you’re not alone. While overall foreclosure rates have decreased since 2008, and are comparable to the pre-recession rates, there were still almost 385,000 foreclosures completed in 2016 alone. Missouri, in particular, has a low mortgages-in-foreclosure rate, at .5% (.3% lower than the national average), but has a high ‘serious delinquency’ rate (over 90 days late on payments) at 2.2%. Credit scores take a long time to build up, and they can fall drastically due to one event. The amount your credit score drops will depend on several factors. In general, the higher your credit score is, the more it will get dinged. Additionally, if you are only late on your mortgage payments and don’t have defaults on your other bills, your credit score shouldn’t take as big of a hit as someone who is late in a bunch of different areas. A foreclosure will remain on your credit report for seven years, but you can start to rebuild your credit during that time. If you miss a monthly mortgage payment, that alone can drop your score anywhere from 50-100 points. After three months, you are looking closer to 75-140 points. Once you hit foreclosure, your score can drop 100-200 points, typically. Again, this will depend on how your score is to start with. Two people with starting credit scores of 650 and 750 could both end with a score of 550 for the same offense. You most likely will not be able to apply for another mortgage to purchase a new house for at least two years, and sometimes longer, even if you have the finances to support a smaller mortgage. With a foreclosure on your record, you can expect to pay higher interest rates, fees, and down payments. In our last blog, we discussed some ways to stop foreclosure. One way to avoid foreclosure is to sell your house fast for cash. Will Close Fast often closes in as little as one week, and will make you a fair cash offer. Selling your Missouri home for cash fast can stop the foreclosure process, keep your credit score in tact, and help you maintain the equity you have in your home. It is important to choose a home investment company that is well-versed in helping Missouri homeowners avoid foreclosure. Contact us today for a free estimate and a cash offer. We’ll make you a cash offer today! We buy ALL houses. No matter the size. No matter the condition. We make it happen - it’s house selling made easy. As your trusted home-buying partners, we make your transaction simple and straightforward. Find out what your house is worth before you assume you have to fix it up. Let us make you a cash offer today! If you're late on your mortgage payments, you do not have to go into foreclosure. We have the solution you need. Questions, comments, concerns? We are more than happy to assist you. Contact us today. ©2017 WillCloseFast.com - Do not copy. All rights reserved.